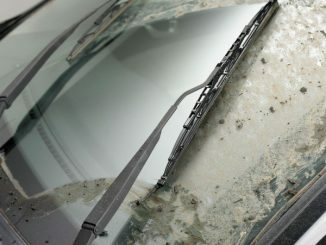 If you live somewhere with hot, sunny summers, a car windshield shade can really help keep your car interior cooler. 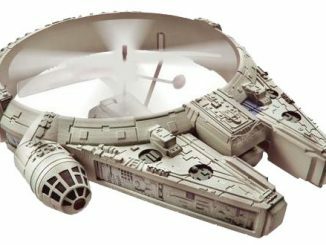 I’ve seen various designs of windshield shades over the years, but none come close to being as cool as this Millennium Falcon Auto Sun Shade. 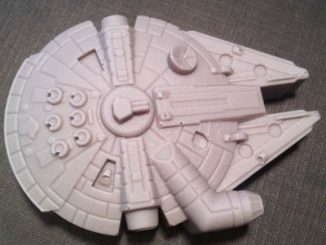 Put this up on your car’s windshield, and to passers-by it will look just like the cockpit of the Millennium Falcon. 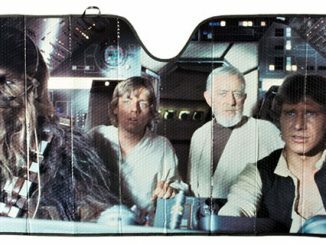 This auto sun shade shows Han Solo and Chewbacca at the controls with Luke Skywalker and Obi-Wan Kenobi standing by in the cockpit. 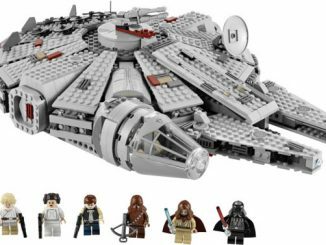 The Millennium Falcon has got to be veryone’s favorite smuggling starship, and geek or not, everyone should immediately recognize this scene from the Star Wars movie. 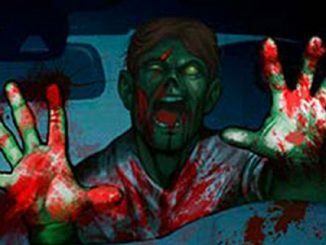 Especially if you have a dark interior in your car, you really need a sun shade. Not only do these keep your car much cooler so you don’t burn yourself on your seat and steering wheel, they also help protect your dashboard and interior from sun damage. 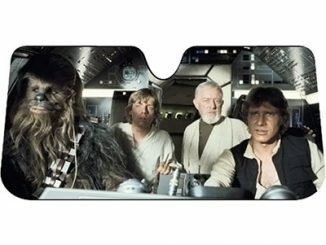 Since you need one of these, why not have a cool one like the Millennium Falcon Car Windshield Sun Shade? 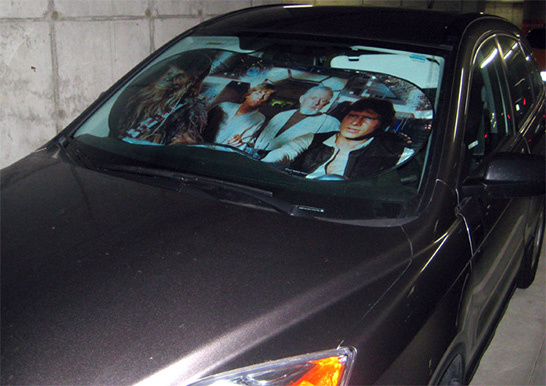 The Millennium Falcon Auto Sun Shade is available exclusively from Star Wars Shop. Be wary.. For small cars, I own a 2005 toyota corolla, this will not fit. Mine just arrived and it is too big. My heart is broken. Wondering if at all you are willing to sell to me your STAR WARS Millennium Falcon Sun Shade?? David, anyway you would be willing to sell yours? hola me podria decir el costo de su protector de auto me interesa un par de ellos espero me pueda informar, me encuentro en mexico .D.F. MIL GRACIAS Y QUE PASE UN BUEN DIA!! 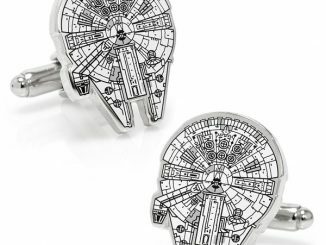 Unfortunately, Star Wars Shop is no longer in business, and I can’t find this in stock anywhere else. 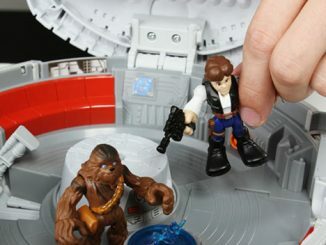 I got mine from ThinkGeek.com but I dont think it is in stock anywhere. 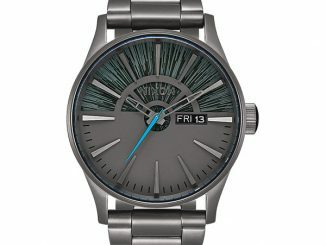 I want this if anyone knows where to buy one. Trying to find one for my son’s birthday August 14th. . . HELP!!!!!!! Really they have the same exact one at pep boys? 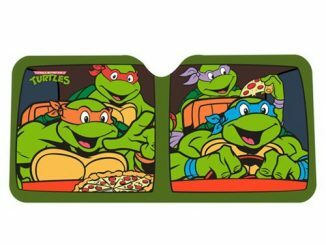 I just got one at Pep Boys for about $15; it’s the same design but the foldable one. It’s too big for my car but I think you can take it to an upholstery and getting it cut to fit your windshield. These look so cool! They seem to come in 2 varieties: the fabric kind with 2 round metal spring hoops, and the accordion kind. I prefer the spring/hoop variety, but can’t find them anywhere. The accordion kind are available on Amazon, but according to reviews don’t last so well with heat/direct sunlight–not good if you live in a southern desert zone like me. Any help finding the spring hoop variety would be appreciated!